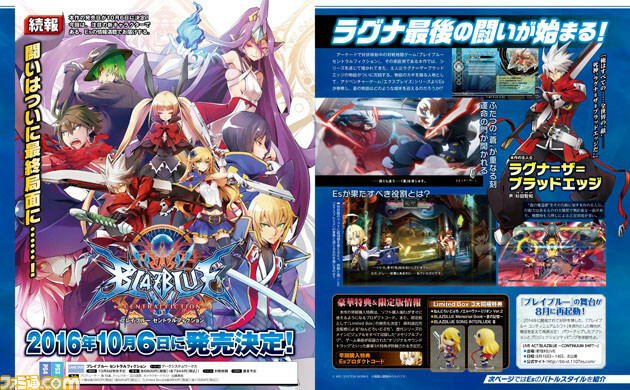 BlazBlue Central Fiction Announced for PS4 and PS3! 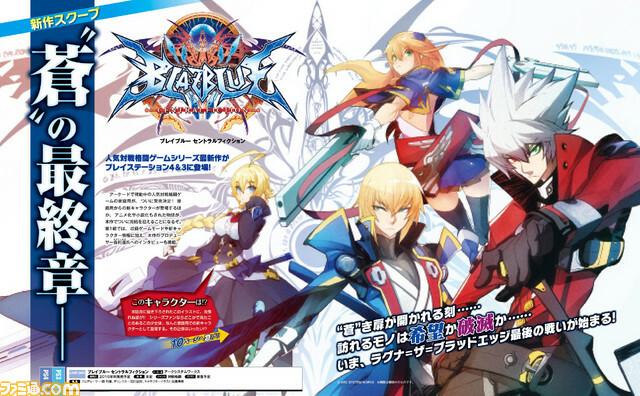 Es from XBlaze added as Playable Character! Famitsu has released another batch of videos from the closed location test a few weeks ago. 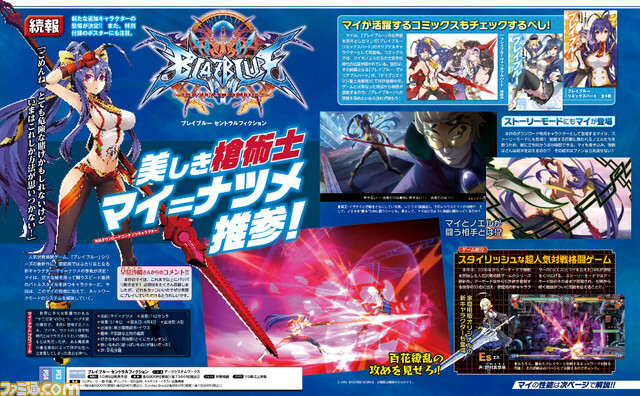 At Toushinsai 2015, Toshimichi Mori of Arc System Works gave a statement that the arcade version of BlazBlue Central Fiction, the latest title in the BlazBlue series, will be launching within the month of November. 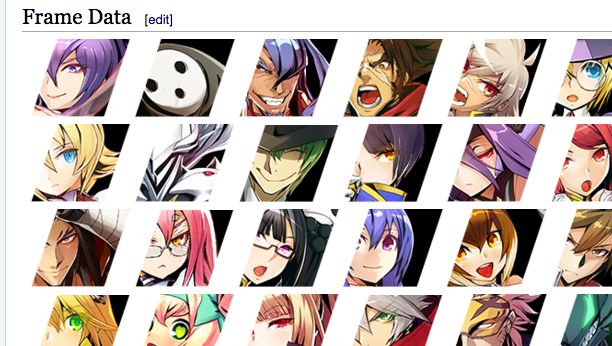 The official website for BlazBlue Central Fiction just had its grand opening a few days ago. The Blazblue community of the Middle East created a BBCPE community combo video showing off ridiculous thing various characters in the cast can do. You can also check out their Youtube channel is where they collect community produced videos as well as footage of their weekly meets. In a recent official stream, Mori announced that BlazBlue Central Fiction would be launching on the 19th on this month. In addition, they have showed off the opening in this stream and Famitsu has uploaded it for people to see. A fact that Famitsu has left out but Mori stated on the stream is that this is only the first of three openings total, one for each Act of BBCF's story. What could waiting for us with the other two openings? BlazBlue Central Fiction Adds "Nine the Phantom"
Central Fiction's third new character arrives in an update coming in December. Her name is "Nine the Phantom". Nine is the first character in the series to not have a "Drive" ability; she instead uses magic. Arc System Works and 4Gamer have published a video where they show off the two new characters Naoto and Hibiki. Even though it's all in Japanese, there's still a lot to be learned about how these characters work. BBCPE is out on Steam now! The game normally costs $29.99 USD but it's got a 10% discount till March 9th. If you own a previous version of BB on Steam, you also get an additional 10% discount. BBCF Fan Voted Color Results! Famitsu has posted the results of the color poll for BBCF! For those that don't know, each character in BBCF is getting a handful of colors from past games that were selected by vote. The results are posted on Famitsu. I'm glad my old Jin color from Continuum Shift is back! Famitsu published an article that features Nine, how her spell system works, as well as some sample combos. Hiago has been kind enough to translate Hima's thoughts on BBCF's new mechanics and how they may affect the metagame. Act 2 of BlazBlue Central Fiction is scheduled for a January 28th release. As you can see from the updated opening, series antagonist Izanami is hinted to be the new final boss of this arc. A trailer for Act 2 boss Hades Izanami has been revealed. She will become available for play alongside the Act 2 update on January 28th. She possesses boss-like abilities such as floating and form-switching among others. The fun is scheduled to start Sunday 12:05 PM JST. Which translates to Saturday 8:05 PM for the West Coast and Saturday 11:05 PM for the East Coast. Arc System Works has announced that the balance patch 2.0 will be heading to consoles on the 31st of this month. along with the release of Jubei as a DLC character. A steam date has yet to be announced though. Famitsu has revealed that Mai Natsume, protagonist of BlazBlue spinoff mangas Remix Heart and Variable Heart, has joined BlazBlue Central Fiction's cast of characters as a DLC character. More info on Mai, as well as some news about BlazBlue Central Fiction's Network Modes, will revealed in this week's issue of Famitsu releasing this Thursday. 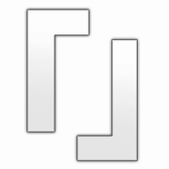 BBCPE Hitbox Viewer by Dantarion! Dantarion (of SFV hitbox, Kenbot and more) has released a tool that takes all the scripts that makes up character data and converts it into hitboxes. Keep in mind that this is directly from the character scripts themselves, so some data may be hard to read, but the data is all there. He also promises similar data for Xrd-R and P4AU in the future! Hi everyone, I know I've been pretty quiet for the past few months... but for a good cause! 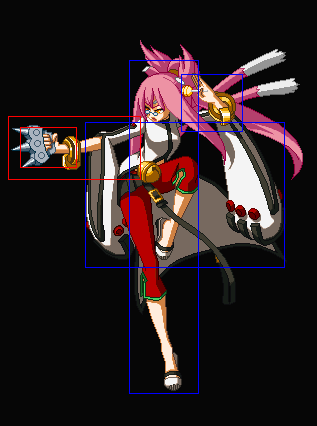 I've been using Dantarion's hitbox viewer to figure out frame data for BBCF! I wasn't able to figure out all values, but the majority of them are all on the frame data pages on the wiki! They're also on GunFrame (iOS/Android app).